I have frequently used the terms "3-Free" and "5-Free" on here referring to nail polish, but have yet to talk about what that means. Zoya is "5-Free," which means their nail polish is free of toxic ingredients such as toluene, camphor, formaldehyde, formaldehyde resin and DBP (dibutyl phthalate.) Other brands such as Butter London are "3-Free," leaving out the more common formaldehyde, resin, and DBP. Scary, right? Like many processed foods, if you can't pronounce it, maybe we shouldn't be putting it on and in our bodies! I LOVE the story of Zoya nail polish as well. Zoya was founded in 1986 by Zoya and Michael Reyzis, originally from Russia. Zoya was originally a classical pianist, but earned her Cosmetology license in 1979 when she and her husband Michael immigrated to the US. I too am a classically trained pianist, and upon hearing this wanted to buy even more to support her. Zoya learned quickly that jobs are few and far between here in the States for classically trained pianists, and decided to make a career in Cosmetology to support her family. Teaming up with her chemist husband, Zoya created and patented anti-wrinkle, shampoo and conditioning products for her salon and spa. Along with these products, he created the first fast-dry topcoat and the now popular Zoya nail polish! On to the promo! 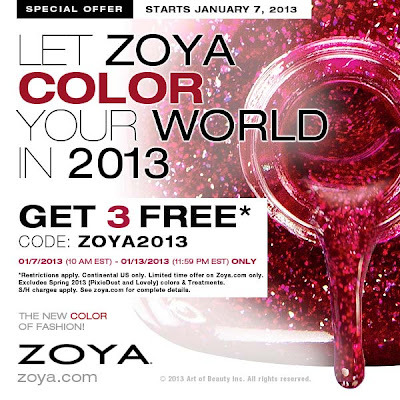 Zoya is offering 3 free polishes starting today, January 7th! All you have to pay is $10 in s&h. Believe me, it's a deal. They're usually $8/bottle, plus $6 shipping, so it's actually buy 1, get 2 free. You can't get drug store brands for $3.33/ea, let alone the quality and color selection of Zoya. I picked up Aurora, Storm. and Maisie. Click on the picture to start shopping! 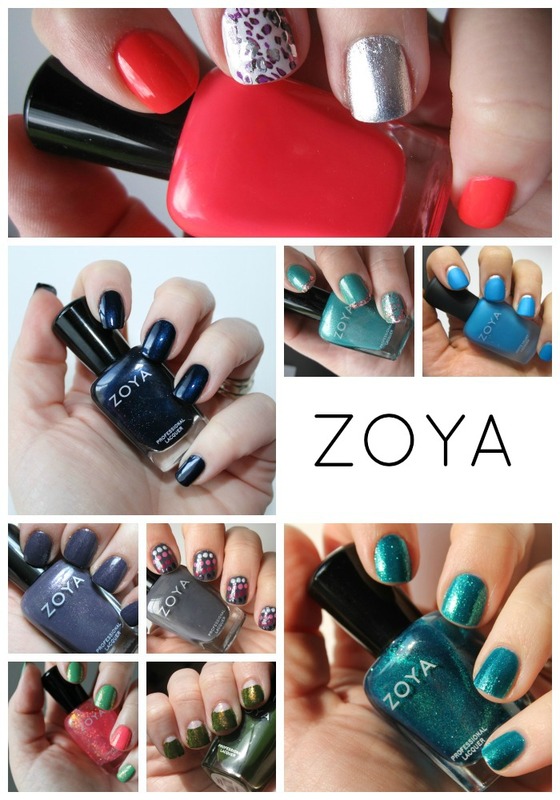 If you're new to Zoya, sign up here, and receive a code for a free polish. If you want to take advantage of the 3 free polishes promo, just save the code for another time! I am linking up for ManiMonday as well. Thanks for sharing this. I have never try there polish before. they have soooo many colors! i got overwhelmed last time i tried to take advantage of this deal!